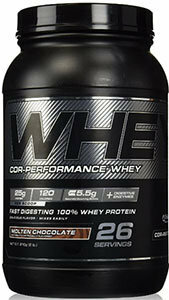 MORE PROTEIN IN EVERY SCOOP WITH COR-Performance: 25 grams of muscle-building 100% Whey Protein. * Cellucor COR-Performance Whey was created with one goal in mind—to deliver a pure protein that packs more protein, and better flavors, into each and every scoop. COR-Performance Whey features a fast digesting Whey Protein Isolate based formula that packs 25G of protein per serving to satisfy protein needs any time of day. Featuring 100% Whey Protein, minimal fat or carbs, added digestive enzymes, perfect mixability and the best flavors on the market, it’s safe to say COR-Performance Whey is here to set the new standard in protein. COR-Performance Whey utilizes some of the most advanced flavor systems available to deliver imaginative, delicious protein flavors that everyone will crave. Sticking to a regimen of exercise and proper nutrition can be tough. Everyone, from rookie to all-star, from novice lifter to seasoned bodybuilder can struggle to get enough protein in their diet. COR-Performance Whey makes it easy to meet your daily protein goals, packing 25G of pure whey protein per scoop, in a wide variety of flavors so you get results, not bored. Mixes Instantly! COR-Performance Whey has been formulated to dissolve instantly in water, milk, or your other beverage of choice. The Cellucor COR-Performance Series features premium, innovative formulas you expect from Cellucor in an all-new line up of commodity sports nutrition products. Featuring clinically suggested formulas and unmatched flavor systems, the COR-Performance Series is designed to satisfy every customer: great formulas, great flavors and great prices. The entire line is Informed-Choice certified and sports a fully disclosed TruFacts label. Because the COR-Performance Series is stimulant-free, the products can be added to virtually any stack, and are also compliant with most major athletic organizations. We have a large selection of in-stock Cellucor products including Whey Protein items and others for the lowest prices at SameDaySupplements.com® It's always easy to shop for Cellucor Protein COR Performance Whey at SameDaySupplements.com® because you can browse by reviews, brand, prices or search for specific ingredients using our search tool. In-stock orders placed before 3pm EST ship out the same day to USA, Brazil, United Kingdom, Canada, Germany, Australia, Japan, India, France and worldwide at the cheapest prices online.